A damning report has exposed a chronic drug problem in a South Yorkshire Prison - with two thirds of inmates admitting it is easy to get a hit behind bars and one quarter having developed an addiction while serving their sentences. 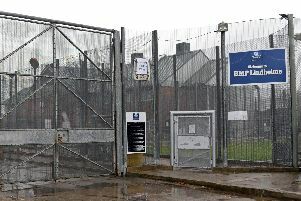 HM Chief Inspector of Prisons, Peter Clarke, has questioned whether HMP Lindholme in Doncaster is a suitable place to hold high numbers of prisoners with organised crime connections who are determined 'ply their trade' while behind bars. A HM Inspectorate of Prisons report, published today, said the jail has an 'intractable drugs problem' and with 'high levels of violence'. It welcomed improvements in the safety of vulnerable prisoners and those who are ‘self-isolating’ because of the violence and intimidation. But in a report on an inspection carried out in October last year, Mr Clarke said: "It is certainly not a reflection of any diminution in the amount of violence or the threat posed to the prison by illicit drugs, which remained severe. "More than two-thirds of prisoners still told us that it was easy or very easy to get hold of drugs, and a shockingly high 27 per cent said they had developed a problem with drugs since being in the prison. "Clearly, more must be done to keep drugs out of Lindholme." He said the length of the perimeter of the prison means it is 'difficult to defend' and combined with the links so many prisoners have to organised crime 'and their obvious resourcefulness in getting large quantities of drugs into the jail,' further progress will be difficult to achieve. He has called on Lindholme bosses to develop a comprehensive and effective drug supply reduction strategy but questioned the suitability of the prison for its current inmates, with one fifth of the prisoners having connections to organised crime. "There is a question to be asked as to whether Lindholme is actually a suitable establishment in which to hold its current population given the apparent intractability of the problem," the inspector said. Nearly all Lindholme prisoners are serving sentences of more than four years, with a quarter serving more than 10 years. An inspection in March 2016 found that safety was significantly compromised by the ready availability of drugs and linked debt, bullying and violence. Safety and Lindholme’s work on prisoner resettlement were both assessed as poor - the lowest HMIP assessment - last year. In the latest report both have improved but are still assessed as 'not sufficiently good'. Inspectors found a chronic lack of GP availability for inmates and expressed surprise that 25 per cent of prisoners were locked in their cells during the day, given that Lindholme is classed as a working prison. Mr Clarke said: "It is clear that Lindholme still has a long way to go, but it would be churlish and wrong not to acknowledge the progress that has been made in the short time since the last inspection. "Lindholme has faced some very serious challenges, and still does. There is always a high risk from drugs and the violence they generate. The leadership at HMP Lindholme have a number of credible plans, and they will need them to be successful if they are to defeat the organised criminals who are determined to continue to ply their trade while serving their sentences." Michael Spurr, Chief Executive of Her Majesty’s Prison and Probation Service, said: "I’m pleased the Inspector has acknowledged the progress Lindholme has made in the short time since its last inspection, but appreciate there is more to be done. "We are working closely with the Police and National Crime Agency to manage and disrupt organised crime gangs and the prison has a coherent strategy to tackle violence and to improve safety. The Governor will use the recommendations in the report to drive continued improvement over the coming months."